Class 1402 Lt. Brett Burns is congratulated by Vice President of Academic Affairs and Provost Dr. Vicki Bastecki-Perez, Commissioner Bruce Castor Jr., and Dean of Social Sciences Dr. Aaron Shatzman. “This is not a one-time process,” said Municipal Police Academy Director Frank Williar, welcoming cadets and their families to the graduation of Class 1402 on Nov. 12 in the Montgomery County Community College Science Center Theater. “We have an obligation to assist each other…to provide resources to each other. People who leave here come back. Moments before, after 19 cadets filed on stage with military precision, Horsham Township Police Officer Kate Ryan came back to the academy from which she graduated with Class 1304 to introduce Williar, who in turn introduced the evening’s special guests: Montgomery County Commissioner Bruce Castor Jr.; Dr. Aaron Shatzman, dean of Social Sciences; Dr. Victoria Bastecki-Perez, vice president of academic affairs and provost; Jesse Stemple, first deputy director Montgomery County Department of Public Safety; East Norriton Police Chief Karyl Kates; East Norriton Police Lt. Brandon Pasquale; Lower Merion Police Superintendent Michael McGrath; North Coventry Police Chief Robert Schurr, Officers Andrew Thiel and Igor Parfeniouk, and Sgt. Rob Malason; and Springfield Police Chief Michael Pitkow. Cadet SSgt. Anastasios Apostolidis called for a moment of silence for those in uniform, both military and law enforcement, who gave their lives in the line of duty. 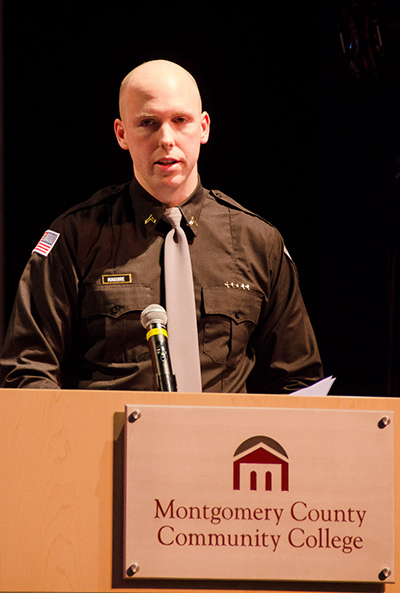 North Coventry Police Officer Andrew Thiel, commander of Class 1302, came back to introduce Keynote speaker Whitemarsh Township Police Lt. Francis “Fran” Wheatley, who congratulated the cadets on enduring a long and demanding course of studies. Burns presented the Director’s Spirit of Distinction Award to Cadet Cpl. Ryan Cifelli of Chalfont, and congratulated Cadet Joseph “Joey” Metzinger on his acceptance to the Pennsylvania State Police Academy. Cadet David Arredondo of Stockton, Calif., won the James R. Miller Marksmanship Award in memory of the Upper Dublin police sergeant who died in a motor vehicle accident in the line of duty in 2004. Robin Pritchett introduced the second annual Charles O. “Chip” Pritchett Exceptional Police Academy Instructor of the Year Award, named in honor of her husband, an East Norriton police officer and Municipal Police Academy deputy director who died in October 2013, and read the name of the second recipient: North Coventry Police Chief Robert A. Schurr. Dr. Bastecki-Perez conferred diplomas on Lt. Brett Burns, Abington; SSgt. Anastasio Apostolidis, Abington; Sgt. Joseph Metzinger, Rockledge; Sgt. Dylan Royce, Schwenksville; Cpl. Kelly Adams, Newtown; Cpl. Josué Gerena, Philadelphia; Cpl. Sean Maguire, Jeffersonville; Cpl. Branden Sisca, Trappe; Cadet David Arredondo, Stockton, Calif.; Cadet Ryan Cifelli, Chalfont; Cadet John Davis, Douglassville; Cadet Colleen Harner, Glenside; Cadet Marc Laing, Trappe; Cadet Christopher Miller, Gilbertsville; Cadet Aamir Raza, Warrington; Cadet Kevin Siebert, Oreland; Cadet John Smart, Bensalem; Cadet Steffy Shane, Perkiomenville; and Cadet Kyle Williamson, Montgomeryville. No doubt, many of the graduates will return to speak at future graduations and to assist their successors. Lt. Burns passed the torch to his own successor, Lt. Brian Manion, Class 1404, completing the continuity inherent in the ceremony. Manion’s classmates provided an honor guard throughout the graduation. The academy has been the training ground for approximately 3,500 cadets with a consistent graduation rate of more than 90 percent. The 800-hour curriculum allows successful students to articulate up to 15 credit hours toward an associate’s degree in Criminal Justice Studies. Geographic Information Systems, or GIS, has applications far beyond maps and geography. Law enforcement, health care, urban planning, economics, environmental science, history, business, real estate and information technology—these are just some of the growing number of industries that incorporate GIS into their daily work. In fact, according to Montgomery County Community College Assistant Professor of Geography Samuel Wallace, virtually every field of study today uses some form of GIS, making knowledge of its use critical for students and employees across all disciplines. “GIS requires people who have basic understanding of spatial relationships, along with the system software,” said Wallace. Montgomery offers a nine-credit Certificate of Completion program in GIS that provides students with valuable skills that can lead to immediate employment in a GIS-related field. The program is ideal for current students, as well as for working individuals who want to add a GIS credential to their resume. The College’s GIS program prepares students to operate industry leader ESRI’s ArcGIS 10.2 software. The Certificate of Completion is comprised of three courses: Introduction to Geographic Information, Map Design in GIS and GIS Applications. Courses are offered evenings to accommodate working adults, and the entire certificate can be completed in under a year. The intro course, GEO 210, is being offered Thursday evenings this fall at the College’s West Campus, 101 College Drive, Pottstown. The next course, GEO 220, is tentatively scheduled to run at the College’s Central Campus, 340 DeKalb Pike, Blue Bell, in spring 2015. According to the U.S. Bureau of Labor Statistics’ Occupational Outlook Handbook, GIS-related occupations are expected to grow by 20 percent overall through 2022—nine percent higher than the average occupation growth rate. To learn more about GIS at Montgomery County Community College, email Assistant Professor Samuel Wallace at swallace@mc3.edu. Fall semester classes at Montgomery County Community College begin on Aug. 27. Visit mc3.edu/fall2014 for registration information. 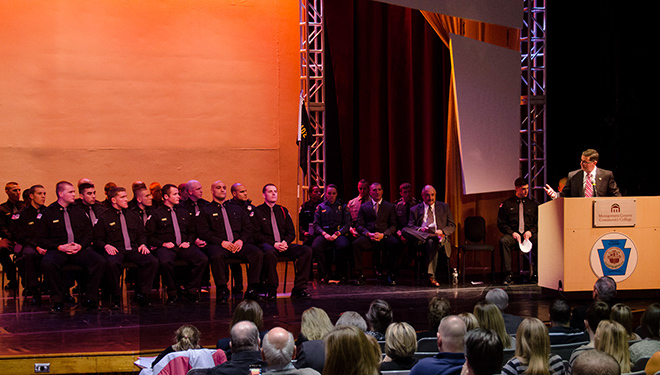 Thirty-four cadets graduated from Montgomery County Community College’s Municipal Police Academy Class 1304 on March 26 during a ceremony held at the College’s Science Center Theater, 340 DeKalb Pike, Blue Bell. Academy alumnus Wayne T. Johnson, Deputy Sheriff with Chester County Sherriff’s Department, sang the National Anthem to begin the ceremony, followed by a moment of reflection from Director of Criminal Justice & Fire Science Programs Benn Prybutok. The Philadelphia Police Department Honor Guard and the Philadelphia Emerald Society Pipe Band led the procession. Patrol Commander Darren Nyce from Upper Dublin Township Police Department was selected by class 1304 to give the keynote address, during which he stressed the importance of preparation. “Prepare for opportunity, [so that you’re] ready for opportunity when it comes. Being prepared to do the right thing at the right moment takes tremendous heart, courage and perseverance, and, at times, great sacrifice,” shared Nyce, who is an alumnus of the Academy as well as an instructor. Montgomery County Commissioner Bruce L. Castor Jr., County Deputy Chief Detective Samuel Gallen, and County Coordinator of School Safety Steven A. Beck were also in attendance, along with representatives from Tredyffrin, Upper Darby, Upper Merion, Upper Moreland and Whitpain police departments and the FBI. Earning the highest GPA in his class, Cadet Cpl. Jason Kesack, Lansdale, offered remarks on behalf of the graduates. Academy Director Frank Williar presented Cadet Lt. Laina Stevens, Philadelphia, with the Platoon Commander Award, describing her as “a breath of fresh air.” Stevens, who is now an officer with the Upper Darby Police Department, then ceremonially handed Academy command over to Class 1401 Cadet Lt. Andrew Burrows, Doylestown. Stevens presented the James R. Miller Marksmanship Award to Eric Meoli, Lansdale. The award is presented in memory of Upper Dublin Police Sergeant Jim Miller, who died in an automobile accident while on duty in 2004. During the ceremony, members of the McGowan family—Karen and her sons Scott and John McGowan IV, presented the Chief John J. McGowan III Memorial Scholarship in the amount of $3,500 to Robert Calvin Wiley, Willow Grove. The scholarship honors the late East Norriton Police Chief John McGowan, who died in a motorcycle accident in 2010. Wiley thanked the McGowan family for the honor, adding that he will use the scholarship to continue his education in MCCC’s Criminal Justice program in the fall. Cadets from class 1304 attended the academy full time, Monday through Friday for 22 weeks. Graduates include Cadet Cpl. James Apgar, Frenchtown, N.J.; Ryan Benner, Drexel Hill; Steve Berg, Levittown; Cadet Sgt. Andrew Brown, Exton; Cadet Sgt. Michael Cabry, Coatesville; Michael Carlson, Elkins Park; Liz Cartwright, Telford; Timothy Clark, Abington; Amber Culton, Quakertown; Zachary Danowski, Skippack; Kevin Deegan, Downington; James Falatovich, Birdsboro; Cadet SSgt. Evan Flora, Collegeville; Jarett Gordon, Collegeville; Patrick Halcovage, Hatfield; Jonathan Huber, Souderton; Cadet Cpl. Jason Kesack, Lansdale; Patrick Kitchenman, Levittown; Cadet Cpl. John Kreuer, Ephrata; Kevin Lowry, Willow Grove; Brett Mackow, Green Lane; Eric Meoli, Lansdale; Jay Nakahara, Allentown; Nicholas O’Connor, Conshohocken; David Pagan, Philadelphia; Stephen Romanic, Coopersburg; Cadet SSgt. David Rosenblit, Philadelphia; Cadet Sgt. Nicholas Ruud, Doylestown; Kathleen Ryan, Horsham; Alex Sansone, Huntingdon Valley; Cadet Lt. Laina Stevens, Philadelphia; Ryan Umberger, Bristol, Gabriel Wasserman, Ambler; Calvin Wiley, Willow Grove. 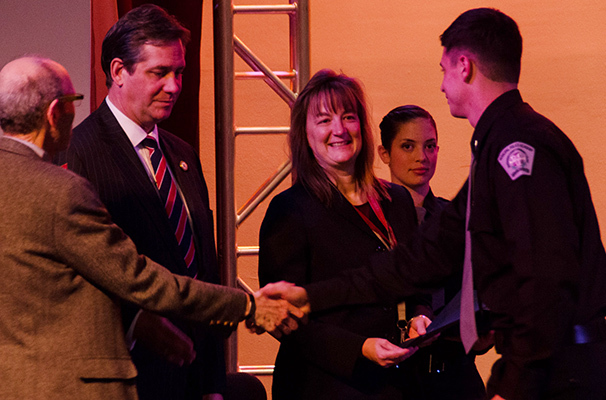 Thirty police cadets graduated from Montgomery County Community College’s Municipal Police Academy on Nov. 14 during a ceremony held at the College’s Science Center Auditorium, 340 Dekalb Pike, Blue Bell. The graduates of Class 1202 included Stephen Andrews (Richboro), Gregory Borgmann (Warminster), Raymond Brook (Maple Glen), Michael Choiniere (Gilbertsville), David Clouser (Quakertown), Richard Dean (Yardley), Shalako Drabinksy (Chalfont), Kevin Furman (Newtown Square), Eric Honick (Conshohocken), Jason Howell (Limerick), Erik Iochum (Abington), Joseph Jennings (Churchville), Salvatore LaMantia (Yardley), Michael Lanzafame (Philadelphia), Bryan Lukens (Whitemarsh), Scott Lukens (Plymouth Meeting), David Malischewski (Perkasie), Joseph O’Mara (Lower Gwynedd), Stephen Pimm (Ambler), Michael Pinciotti (Newtown), Benjamin Romanowicz (Bensalem), Benjamin Scott (Pennsburg), Brian Seibert (Worcester), Jennifer Smith (Abington), Kevin South (Morrisville), Rafael Stoppazzollo (Philadelphia), Michael Theiss (Tuckerton, N.J.), Michael Verrillo (Warrington), Anthony Vogel (Horsham) and Zachary Wise (Phoenixville). Valedictorian Sgt. Stephen Pimm earned the Sgt. James R. Miller Marksmanship award, and Lt. Bryan Lukens earned the Leadership Award. Sgt. Richard Dean was awarded the Spirit of Distinction Award for his teamwork, discipline, dedication and leadership. Guest speakers for the evening included Sgt. Ken Hawthorn of the Warrington Township Police Department and Montgomery County Commissioner Bruce L. Castor Jr. Montgomery County District Attorney Risa Vetri Ferman also attended. In his remarks, Hawthorn told the cadets to “be firm but be fair,” and not to dwell on mistakes. During the ceremony, the McGowan family presented the Chief John J. McGowan III Memorial Scholarship in the amount of $2,500 to Orwigsburg Borough Police Officer Matthew Fogarty of Royersford. Fogarty graduated from the Police Academy in July 2012 and also serves as an emergency medical technician. 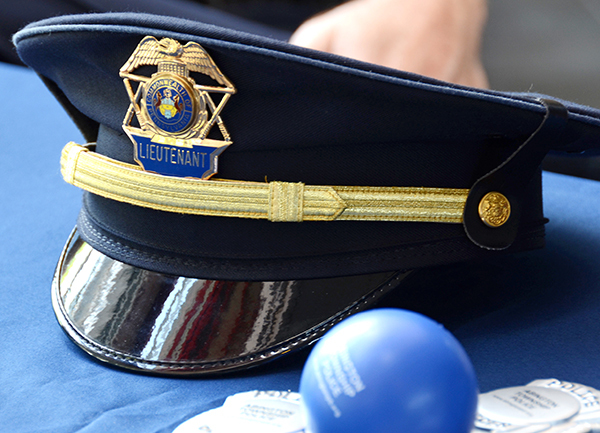 Chief McGowan started his law enforcement career in 1974 with the Lower Moreland Police Department. While working there, he graduated from the FBI National Academy and earned his master’s degree in Criminal Justice from St. Joseph’s University. After his retirement in 1992, he became the police chief and public safety director for East Norriton Township, a position he held until June 18, 2010, when he was involved in a fatal motorcycle accident. In addition to his law enforcement career, McGowan was an academic instructor in the Criminal Justice program at Montgomery County Community College. He also served as past president of the Montgomery County Police Chiefs’ Association and the FBI Law Enforcement Executive Development Association and was instrumental in establishing the Mission Kids Child Advocacy Center. At the conclusion of the ceremony, Academy Director Frank A. Williar praised Class 1202, stating that the members of this class are definitely people he would recommend to safeguard his family and the community. The Academy has been the training ground for approximately 3,200 cadets with a consistent graduation rate of more than 96 percent. The 800-hour curriculum allows successful students to articulate up to 15 credit hours toward an associate’s degree in Criminal Justice. Williar, a 1974 Police Academy graduate, was hired as the Academy Director in 2005. The Academy is certified by the Commonwealth of Pennsylvania through the Municipal Police Officers’ Education and Training Commission.